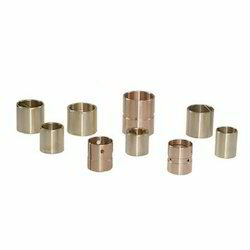 Our range of products include metal guide bushing and brass guide bushes. We are one of the well known manufacturers and suppliers of MetalGuide Bushing. The offered guide bushing is an ideal bushing medium needed for bearing the high torque generated by the moving rotor. Our offered guide bushing is very versatile in bearing the high torque and compression of the rotors. The offered guide bushing is known for the exceptional toughness and hardness. Our offered guide bushing is available at affordable prices.